What Does Operation Game On Do? Golf equipment including a brand new full set of Taylor Made clubs and golf bag. 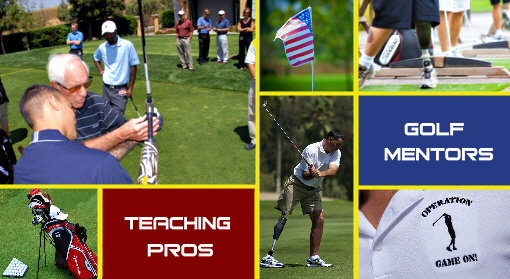 Foremost, we are giving these HEROES the confidence and the chance to transition from the trauma of IEDs and dangerous missions to the accomplishment and thrills of GIRs and sinking a birdie putt. Operation Game On does not want to leave out the wives of our troops. In the FALL of 2012 we began taking this program to the wives of combat-injured troops. It’s been rewarding to introduce them to this wonderful game of a lifetime too. View their heart-warming video. Special thanks to the Del Mar Golf Center for helping us reach our goals and a huge thanks to TaylorMade Golf for providing us with anything we need. There are also so many instructors, volunteers and special partners that go out of their way to help us. We thank you all!